The BayMAX™ LED is part of the DesignLights Consortium®, making the fixture available for national utility rebates. The fixture is available in 130-, 160-, and 200-Watt (W) models and is designed to replace up to 400-W metal halide bay fixtures that require mounting heights of 15-40 feet. 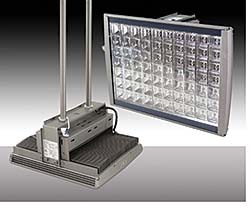 With an enclosed power supply housing and covered optics, the LED fixtures are designed with die-cast aluminum bodies. Dimming drivers enable adjustable lights using third-party occupancy sensors and control systems. The pendants are IP65-rated for wet locations and engineered with high-efficacy LED boards featuring LM-80 tested LEDs protected by a tempered-glass diffuser.